The Guernsey Literary and Potato Peel Pie Society is an epistolary novel set in 1946, just after the end of the Second World War. The novel revolves around Juliet Ashton, a writer who kept a popular wartime newspaper column. One day, Juliet receives a letter from Dawsey Adams, a resident of Guernsey who tells her he owns a second-hand book that once belonged to her. Very soon, Juliet is introduced to the Guernsey Literary and Potato Peel Pie Society – a reading group that began as a cover up story for Nazi soldiers, but which soon materialised and helped its members through the difficult occupation years. Their mutual love of reading brings Juliet close to the society’s colourful members. As she learns more about everyday life under the German occupation of the Channel Islands, she realises she has found the subject of her next book. But as Juliet continues to exchange letters with her new friends, it becomes increasingly clear that her interest in Guernsey and its inhabitants is more than just professional. That’s what I love about reading: one tiny thing will interest you in a book, and that tiny thing will lead you on to another book, and another bit there will lead you on to a third book. It’s geometrically progressive – all with no end in sight, and for no other reason than sheer enjoyment. This passage made me smile because it reminded me of how I got to this book: I picked it up at long last because Code Name Verity made me want to read more about life under Nazi occupation. While reading it, I scribbled down the titles of many of the books Juliet and her friends discuss, and I will no doubt get to them some day. And thus the geometrical progression continues: from one book to another and so on and so on. 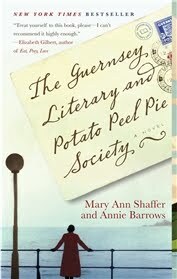 As I said above, Juliet is at the centre of The Guernsey Literary and Potato Peel Pie Society, but she’s not alone. She shares the spotlight with Elizabeth McKenna, a character who looms large even though she doesn’t get any actual screen time. By the time Juliet meets the members of the Literary and Potato Peel Pie Society, Elizabeth, its founder, has been missing for years; as more stories about her past and what happened to her emerge, it becomes clear why she was the heart of her community. It’s difficult to make a larger-than-life character such as Elizabeth McKenna work: she’s beloved by almost everyone, and the only character who has anything bad to say about her is so completely over the top that there isn’t the slightest chance readers could ever take her seriously. There was some risk that the hero worship surrounding Elizabeth would make her somewhat hollow or unconvincing, but Mary Ann Shaffer and Anne Barrows manage to make it work. I think the main reason is that by the time we get to the end of the novel, we realise there is a lot we don’t know about Elizabeth because we only ever saw her through other people’s eyes. Yes, she was smart and generous and brave and she did everything she could to help her friends. But there are glimpses of the scared and vulnerable human being being she was underneath all that. These glimpses are often pushed aside in the stories her friends choose to tell about her, but once readers realise that Elizabeth’s story is one of irrevocable loss, the elegiac and idealising way others speak about her becomes moving in its own right. We are seeing Elizabeth through the eyes of grieving friends, and while the stories they tell about her are true, they are not the only truth. One of the things I liked the most about The Guernsey Literary and Potato Peel Pie Society is that it’s full of humane moments; moments when the distinctions imposed by war are blurred and people become simply people. The novel doesn’t dance around the fact that the Nazi occupation was incredibly difficult for civilians, that people went hungry, that families were separated, that many losses were permanent. But it also acknowledges that the lines drawn by war were far from black and white, and that on both sides there were good people doing the best they could for others. In many ways, this story is a perfect embodiment of the trope of the rural/island community as a magical place full of quirky people where a former city-dweller rediscovers herself and finds a new direction in life Chris was discussing the other day. However, most of the characters are multidimensional enough that they become much more than mere props. Their back stories emerge slowly and give the novel real heart. The Guernsey Literary and Potato Peel Pie Society is both funny and serious, and it’s sweet without ever crossing the line into saccharine. My one small complaint is that for an epistolary novel that gives voice to a wealth of characters, the tone is remarkably uniform: a letter from one character sounds much like a letter from the next. But the novel is otherwise so charming that this was easy enough to forgive. Wikipedia tells me that there may be a movie in the works starring Kate Winslet as Juliet Ashton. Is anyone excited? I read this one pre-blogging and I think your post just proved to me that I need to write down thoughts of books for me to remember what they were about. I had a vague recollection of very much enjoying this book, but that's about it. I think it's time for a reread. I AM glad to see you liked it! I think this was a big hit a few years ago and I've got in on my wishlist. I don't know much about the history of Guernsey and was surprised to learn that there was a Nazi outpost there. Intriguing! I also read this pre-blogging. I grabbed it off of the teacher's room book shelf and am so glad I did! Thank you for your thoughts! I really like what you said about Elizabeth - how we see her through the eyes of idealizing friends, but even in their words, hints of a more complex character arise. I liked that too. My only grip abut this book is that I thought the romance was ...mmm... slightly thrown in? Maybe that's not what I want to say. I found it didn't quite have the ring of truth? Close, but no cigar? What did you think? I don't know if you ever got around to reading The Soldier's Wife by Margaret Leroy. It also takes place during WWII on the Guernsey Isles, but has a decidedly less benign portrayal of life during that time. It's worth reading for the comparison, and besides it is a great "discussion" book given the moral dilemma presented. Sounds like a warm read. I love the title! This is one of my all-time favourite books and am definitely thinking I need to re-read it again (thanks for the reminder :)). The first time I went to BEA this was the big book they were promoting, but the title was so off putting to me! WWII is kind of off putting to me, too, :/ (a big difference between us!) but I still think I might read this someday, I mean...everyone seems to find it worthwhile. I really liked this one. I avoided it for years because of the silly title, but I ended up enjoying it. I agree that it was the humane moments. It showed how war affected a small community, not just the soldiers fighting it. I'm one of maybe a half-dozen people who didn't love this book. In fact, I think it was a victim of its own hype for me because I might have liked it fine if I'd come across it randomly, which is kind of a shame. Even though I didn't like it as much as you did, your review actually gets at my main sources of dissatisfaction. I found Elizabeth far too good to be true, and I'm hard to please when it comes to those rural tropes. I think growing up in a not especially magical rural area and finding myself in the city makes me, ummm, skeptical. And I agree with Mumsy about the romance. Ah, so it was you, that one person in the world who still hadn't read this one! I enjoyed it very much and it made me want to read 84 Charing Cross Road all over again. Like you I also noted down the books/authors mentioned. Charles Lamb crosses my path very often and I'll have to pick up something by him soon (and probably review it for PGP). This book did add a level of humanness to the Nazi soldiers. I just loved it! This was a book that took the blogging world by storm a few years back, and I never read it. I am now wishing that I had a copy, but that is easy to remedy. I loved the thoughts that you shared about this book, and particularly the bit about how one book leads to others. I find that so true, and that is one of the best things about reading. Very nice post today, Ana. I enjoyed this review and am glad that this book is back on my radar! This is one of those books I really liked when I read it, but the finer points of the plot haven't stuck with me very well. Although, it's one I'd re-read for its charm. I would definitely be excited about a film adaptation with Kate Winslet! I added this book to my library wish-list last night. I read this book last year and loved it. I agree that one of the best things about the book was the way it portrayed the humane aspects of the war - it was very inspiring to see how people were working together and trying to help each other through such a difficult time. I didn't know anything about the film, but will look forward to it! I wasn't a huge fan of this one even though I love epistolary novels. It was too saccharine for me I think. I read this book a few years ago. I really enjoyed reading it and recalling it through your great post. I forgot you read this book! I read it ages ago and I remember you saying in an email that you had read it recently, but then there was no review... I am glad you wrote one. I really want to reread it not to mention see the movie! I read this book a while ago, and I loved it! The moment it won me over was when Juliet comes home to see her fiance replacing all her books with sports trophies and is like, "I don't think this relationship is going to work." I would have liked the romance to be fleshed out a bit, but overall it was a perfect short novel. Oh, I so loved this book. I usually don't like books told through letters, but I really loved this one so much. You are spot-on -- it's lovely and charming but never saccharine. I really loved it. I had honestly thought you had read this! I loved it when I read it. Such a gorgeous book. Iris: Yes, I've been noticing that more and more. I've been a very lazy reviewer lately, but the truth is that these days the process of reading a book doesn't feel complete until I've written about it. Sakura: I knew next to zero about it too. The historical aspect was really interesting! Debi: Enjoy! It's a good pick for when you need a quick and comforting read. Mumsy: Yes, I agree. I was far more interested in Juliet's friendships than in the romance. Jill: Thank you so much for that! Bookmarked for future reference :D And I still haven't read The Soldier's Wife, but I really want to. Care: If well done it could be really great! And I just love Kate Winslet. Amy: I remember those days! It's funny to think about that down, isn't it? Anyway, I do recommend giving it a try even though you're not too crazy about WW2 books. The human aspect is what makes it worth it (much like in Code Name Verity). Melissa: Yes, exactly. I love stories that shed light on the personal and social side of big historical events. Teresa: Those are all fair points - I thought there was enough in the book to compensate for them, but I can definitely see why another reader would feel differently. Alex: Yep, guilty as charged :P Looking forward to your eventual Charles Lamb review! This book really made me want to read him. I may enjoy this book. Although I love historical novels, it was not until recently that I found this particular time period of any interest. After reading 22 Britannia Road, I am ready for more. Thank you for your thoughts on this one. I loved this book when I read it a few years ago! And, yes, I am excited at the prospect of a movie! Your review made me smile. Funny how you had read 84 Charing Cross Road and then Code Verity made you want to read The Guernsey Literary and Potato Peel Pie Society, when I actually first read Guernsey, then discovered 84 Charing Cross Road when I had asked for epistolary novels recommendations, and recently through your and other reviews I've been wanting to read Code Verity... This similar chain of books but going in the exact opposite order made me smile. Your review makes me want to read this book more than any other has, up to now. I can totally relate to one book leading to another, to another, and so on! I read this book a few years ago and absolutely loved it. You've made me want to re-read it again at some point. I think Kate Winslet would be great for the movie version. I loved this book when I read it, Ana, so much that I gave a copy to my mother last year. I laughed out loud at the funniest parts! and I cried at the saddest, and it made me remember how much fun epistolary novel can be. It was truly delightful. I'm happy you enjoyed it also, and I like the good and bad you point out in it. and it was one of my books of the year for that year. Like everyone else, I completely fell in love with this book when I read it; I am so glad you enjoyed it too! You've reminded me that I really do want to re-read it again, but in the meantime, I'm curious to see how they handle it in a movie version. It could very easily cross the line into something that's too sweet, as you say, something the book avoids.